SONOMA COUNTY, Calif. (KGO) -- The Sonoma County Wildlife Rescue has a message: Please, don't kidnap bunnies! The rescue posted on its Facebook page today about a teeny, black-tailed Jackrabbit, picked up by someone who thought it needed help. But the rabbit was just fine, according to the group. The healthy baby and showed signs of being cared for by its mother, who may have been forging for food. 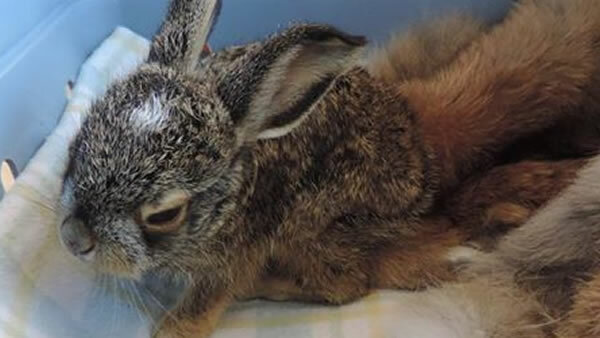 The rabbit appeared to have exchanged hands a few times, according to the rescue's Facebook post, and they were unable to track down exactly where the baby was picked up or find a way to reunite it with its mother. It's something the wildlife rescue has seen before -- well-intentioned nature lovers trying to "help" when no help is needed. Officials say that when baby rabbits are hunkered down in the grass alone, they are not in need of care. Hiding in the grass keeps them out of sight from predators while their mother spends the day foraging for food. They say the bunny sitting in place and is typically being cared for, and taking it away is akin to kidnapping. If it is crawling around a yard and "searching" for its mother (this can be a sign that the mother has not returned and it is willing to risk leaving where she left it to find her). If the rabbit is at least 4-inches long with wide eyes and erect ears, it is an "independent juvenile" and doesn't need rescuing. Click here to learn more about baby mammals and what to do if you find one.